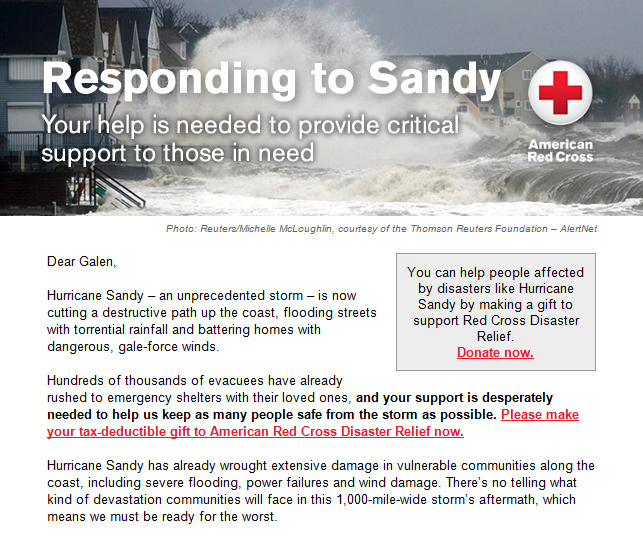 Why Does This Red Cross Appeal Feel Sleazy to Me? This emailed request for donations thumped into my inbox about 2 pm today. It bothers me. I know the Red Cross does lots of great work. I know they are doing that work now. I have given them money in the past to help support their work. This email is just too damn timely. Too calculated. Too tailored. Too in tune with modern marketing techniques. They are using the hurricane. It doesn't feel right. Or, am I expecting too much from a do-gooder organization that needs more funding to do more good? Oh, yeah. If you think I'm overreaching and want to teach me a lesson, go ahead and give the Red Cross money. It's all about marketing. If there had been a real tsunami issue with the recent large quakes in northern British Columbia, you'd have seen the same ad with the names changes and maybe a different graphic. It's cut and paste and get it out there quickly.